100% brand new and high quality, Outdoor sports fun children intelligence development educational toys.This item offers your kids much more fun. Quality rip stop nylon material will last and last for use over and over again.Easy to use,no strings to tangle,no batteries to replace,no assembly required. 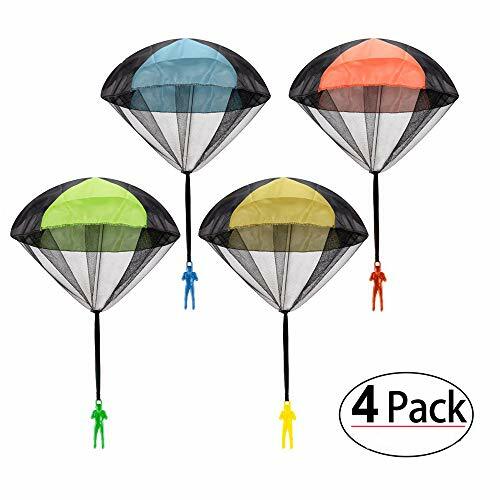 Imitate the landing principle of the real parachute, it landing slowly.Improve children's manipulative ability, bringing more fun, the perfect gift for your children. Best performing tangle free toy parachute. Simply toss it high and watch it fly. It's good for children to develop their intelligence. Suitable for: 3+ years old; Package Included: 4 x parachute solider. Challenge your children's imaginations and keep them active.Take the toy when you take your child to go outdoors or travel, it will bring more fun to your family or children, Promotes not only kid's communications,but also their feelings. Material: Cloth, Plastics and Polyester. Package Quantity: 4 pcs Set. Color: Blue, Orange, Green, Orange. ✅ Best Performance：Tangle free toy parachute to toss them up and watch landing slightly. We are the best seller in the parachute figure category. ✅ Real Parachute Landing Principle：Imitate the landing principle of the real parachute, it landing slowly. Improve children's manipulative ability, bringing more fun, the perfect gift for your children. ✅ Safe and Four Colors：The paratrooper toy made of nylon & plastic, and has been tested to meet USA safety standards. Magic Snake have four colours, Blue, Green, Orange, Rose Red may vary and are selected at random. ✅ Advantages：Perfect for travel or outdoor recreation. It will bring more fun to your family or children. Promotes not only kid's communications, but also their feelings and intelligence developent educational. ✅ Great Gift：Perfect for both boys and girls, and also for Easter basket, stocking stuffer, Christmas tree ornaments, hanging decoration, Thanksgiving Day gift, birthday, or party favors. View More In Flying Toys.